The partnership between Aurora Public Schools (APS) and MIE was formed in Summer 2015 in order to build APS district capacity to operate successful schools at scale and build excellence in these schools for the long-term process of sustained improvement. To this end, MIE has facilitated a stakeholder-driven process to design, implement, manage, and sustain an ACTION Zone, a model pioneered in MIE’s groundbreaking 2007 report, The Turnaround Challenge. Innovation status through an ACTION (Aurora Community-Based Transformation, Innovation and Opportunity Network) Zone gives schools more resource autonomy and flexibility to support innovative school models targeting specific student and community needs. In order to secure and retain these flexibilities, Zone schools must demonstrate that they can integrate innovations to achieve better results together and economies of scale. However, pursuing innovation status is, in some ways, like the proverbial dog who chases the car. Now that you’ve caught it, what will you do with it? School leaders face difficult choices in how they prioritize their time when everything is going smoothly. When you have to figure out collaborative structures with your fellow school leaders to ensure mutual success, it becomes much more challenging. Aligning schools around shared strategies that address shared root causes experienced by very different buildings is a significant technical achievement. However, the true challenge of Zone collaboration is continuously prioritizing collaborative efforts that will most benefit your (a) school amidst the urgent needs of running your (a) school building daily. School Leaders are Setting the Strategies for Zone Collaboration. To support Zone schools with the collective implementation of Zone pillars, the Zone Office, Office of Autonomous Schools (OAS), holds a monthly ACTION Zone Leaders meeting. Last month, the OAS asked school leaders to reflect on their expectations for joining the Zone last year and to consider current realities and requirements of Zone work. Leaders highlighted that they have spent a lot of time determining how unique innovations will be implemented at each school and that further collaboration will be critical to Zone-wide success. School leaders left the November meeting with a clearer vision for their Zone work and with consensus on the shared strategies and activities they will prioritize for implementing the Zone pillars this school year. We need to ramp up our “network mindset.” Zone schools are beginning to see themselves as a truly collective network of International Leadership schools. 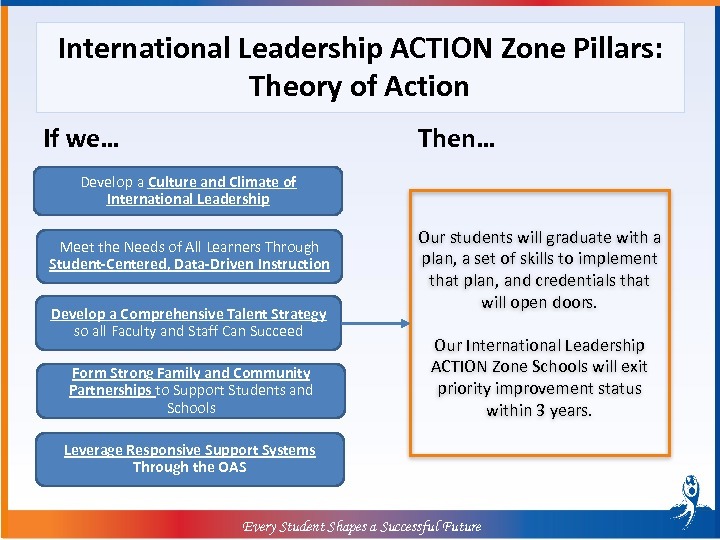 School leaders indicated that they are excited to fully develop what it means to be an International Leadership ACTION Zone with their staff, students, and community stakeholders. Collaborative culture must be nurtured across many stakeholders. Deep and embedded collaboration across schools will require numerous school stakeholders to come together on a regular basis to decide how innovations can be jointly implemented while remaining true to each school’s needs and priorities. Zone-wide working groups will be formed to encourage shared leadership and conduct the powerful work of collaborative innovation. Momentum can and must be measured. Zone-wide performance measurement systems will hold schools accountable for achieving collaborative success, and will provide an avenue for identifying and sharing those successes with a broad range of stakeholders. Sharing out on these successes will breed further success, reinforcing the networked nature of the ACTION Zone. Systems change requires changing many systems. It is necessary to rethink and align existing district structures to fully implement Zone autonomies and flexibilities. As the Zone pursues new and innovative strategies, there will be a continued need to collaborate with district divisions to consider implications for people, time, programs, and resources. Engagement Director Matthew Bachand contributed to this post. * MIE supported the work of the ACTION Zone and school design by facilitating the innovation application process. During the design phase, MIE also helped APS create the Office of Autonomous Schools (OAS) to lead, support, and monitor performance of the Zone. MIE now collaborates with the OAS on a regular basis to build Zone and turnaround capacity within APS, plan and facilitate Zone-wide meetings, and support the implementation of the shared Zone pillars.